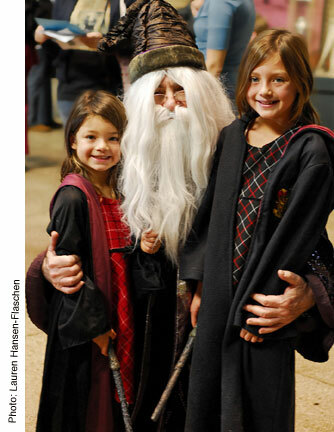 Harry Potter fans are in store for a magical day on Sunday, November 22, when the Penn Museum opens at 11 a.m. for Harry Potter and the Magical Muggle Museum. Above: Guests meet Hogwarts headmaster Professor Albus Dumbledore. The event, which ends at 4 p.m., allows guests to take Ordinary Wizarding Level exams, adopt a magical creature, play Snape Bingo, attend Quidditch practice or participate in more than 30 different all-ages activities. The event, free with Museum admission donation, is presented by Penn students from the anthropology and cinema studies course, Mythology and the Movies, with the support of the Museum’s Women’s Committee.